Parents being pestered for a pet but unsure whether their children would care for it properly are being thrown a lifeline - Freddie the hamster. Freddie is the star of a rent-a-hamster scheme which is being run by a Swansea pet shop. Pat and Jim Robinson hire him out for £5 a week, so parents can find out whether children really want a pet. "It's difficult to tell whether a child will really take to it or lose interest after a few days," Mr Robinson said. "The idea stemmed from our passion for animal welfare. Hamsters are generally quite cheap pets, and therefore they are more likely to be an impulse buy. "If parents can rent one for a week, they can find out whether it's just a passing phase or not. At the same time, it teaches children about being responsible for a pet." Freddie arrives at each new home complete with cage, food, bedding, and care manual. Pat Robinson said some people who could not commit to a pet full-time were turning to renting as an option. "There are some busy families who haven't the time to commit to looking after an animal full-time but, at the same time don't want to deprive their child of the pleasure of having a pet in the house," she explained. 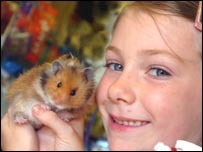 "Some will rent a hamster from us again and again, particularly during the school holidays when their children are able to give the hamster their full attention. "Hamsters are very stress-free, so moving from house to house doesn't bother Freddie. He copes well with a change of environment. Freddie is very personable and loves lots of handling and lots of attention. He seems to thrive on it. "Before he goes to someone's home, we talk the children through feeding him and cleaning his cage." The sad reality about hamsters is that they only have short lives - most only live to around the age of two. Consequently, Freddie is the third hamster they have put out to rent - following in the footsteps of Daisy and Freckles.